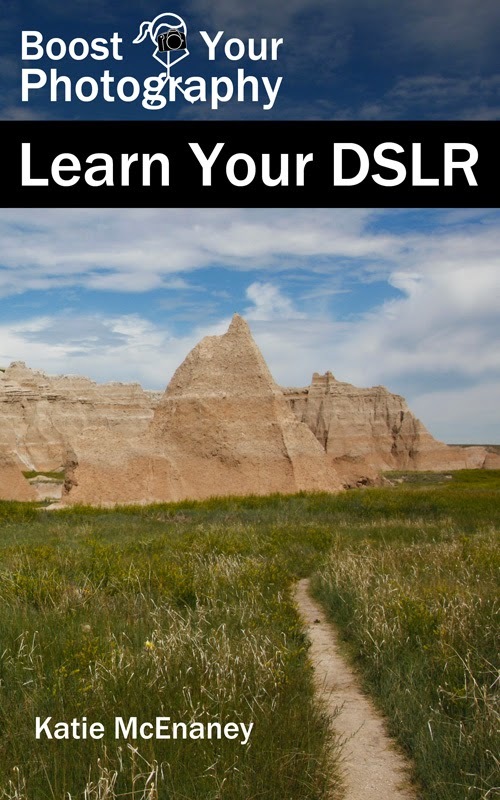 This post provides the results of a head-to-head comparison of six online photography retailers. 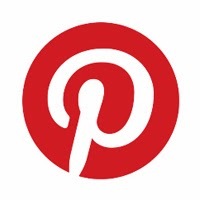 The previous post in this series provided details about each of the companies. 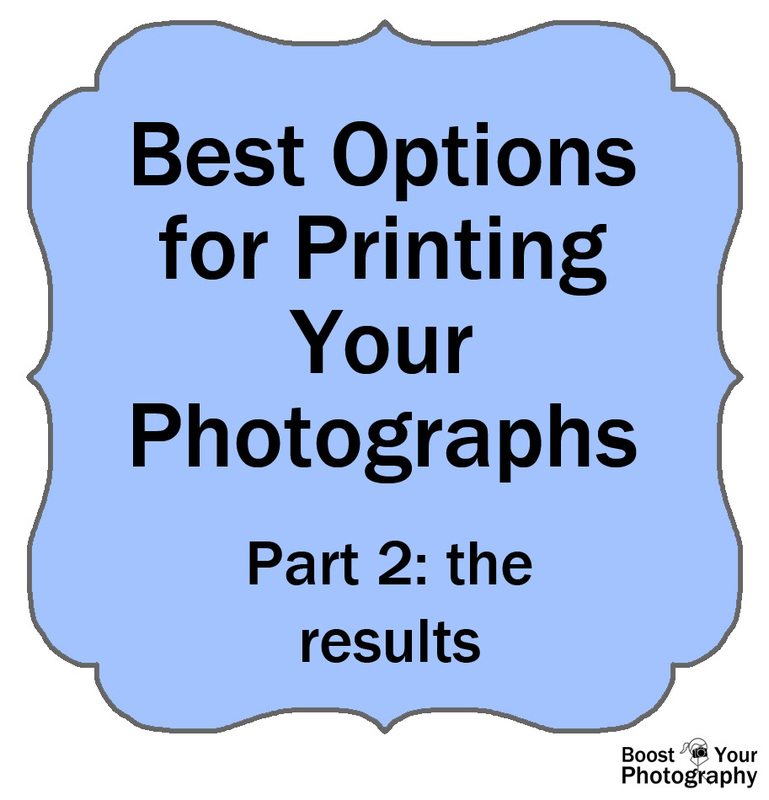 The next post will explore different media for printing your photographs (types and styles of paper and finishes). I choose this photograph of Mammoth Hot Springs in Yellowstone National Park for its vivid colors and dramatic sky. I was curious to see how the different prints would handle both the range of colors as well as the range of tones in the sky. 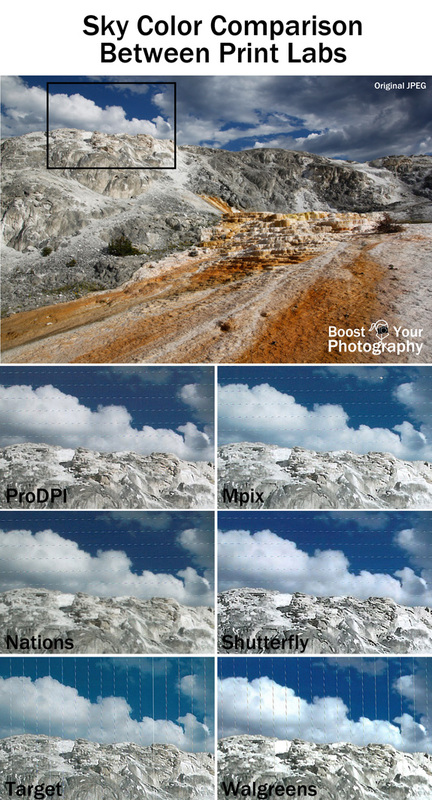 As you can see from the comparisons, Pro DPI and Nations rendered a similar blue in the sky and contrasts in the clouds, while Mpix and Shutterfly lightened and brightened both the sky and clouds slightly. Target added an almost greenish hue to the sky, while Walgreens is the lightest, with a portion of the clouds blown out to white. This comparison focuses in on the various orange terraces. All prints differed in their interpretation of both the colors and clarity of details in this section of the image. 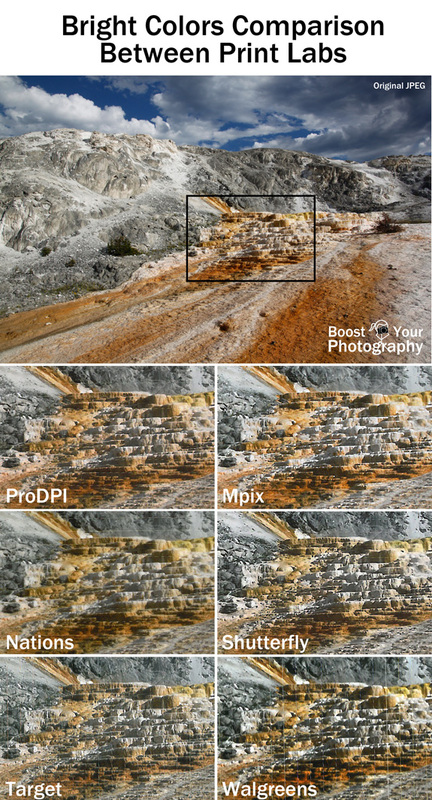 Pro DPI softened the contrast, while Mpix has a more accurate representation. The Nations print is extremely soft and nearly muddled, while Shutterfly is overly contrasty and has too much white. 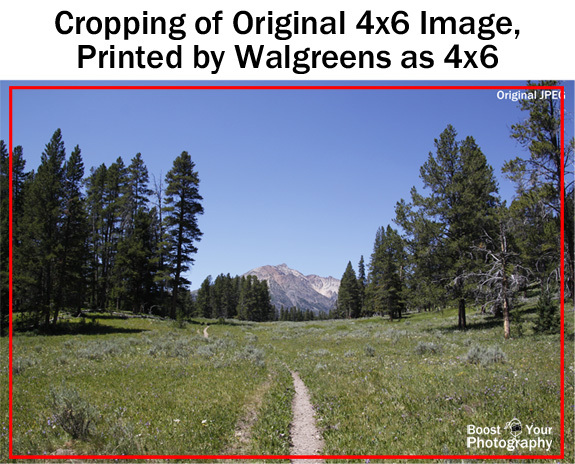 The Target print is washed out and dull, and Walgreens is overly shadowed and dark. Photographs of people, and especially tiny people, are some of the nearest and dearest to our hearts. Thus, it was a bit shocking to see how poorly some of these baby prints came out. The Mpix print, while still a little brighter and oranger, came the closest. The Pro DPI and Nations prints came out darker and a bit more gray. The backgrounds for Shutterfly, Target, and Walgreens turned gray and lost the warm tones, while the face became varying degrees of dark and shadowy. A final consideration is print size and cropping. One might intuitively think that if you are ordering a 4 x 6" print, then you will receive a print that measures four by six inches, but that is not always the case. 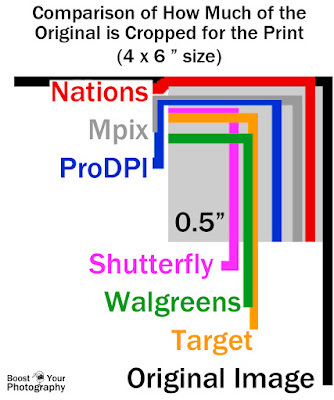 Both Pro DPI and Nations provided prints that measured exactly 4 x 6 inches. The prints from Mpix were slightly larger at 4 x 6 1/16 inches. Target and Walgreens provided slightly smaller prints at 4 x 5 31/32 inches and 3 15/16 x 6 inches, respectively. 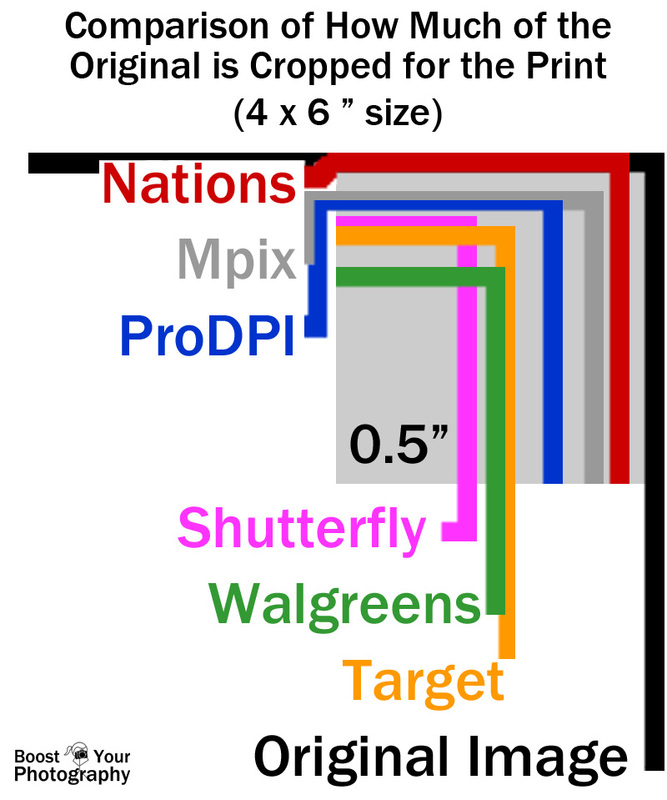 Shutterfly's prints were the smallest at 4 x 5 7/8 inches. Given all the various factors, in my book Mpix is the winner. 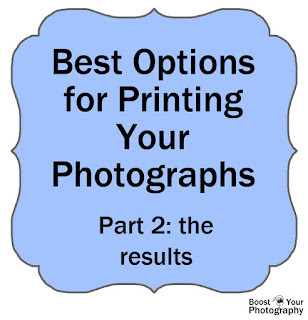 Pro DPI had very good results, but at two to three times the cost of the other retailers, the higher prices do not seem worth it, especially if you are planning to print a large quantity of 4x6s for an album or scrapbook. Nations was a close runner up. Because I do not have a color-corrected monitor, I appreciate that Mpix includes color correction as part of the cost of the prints. If you have already color-corrected your prints, then you may prefer Nations, though I do felt like many of the prints from them lacked clarity and were less crisp than others. If I was in a hurry and need photographs printed immediately, I would go with Target, but be warned. Their online ordering applet is buggy, and if their machine goes down, it will likely be down for days or a week, as they do not have in-store (or even in-town, it seems) technicians. 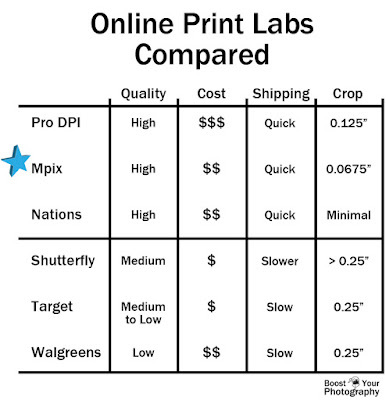 With both Mpix and Nations, prints arrived extremely quickly, within 4-5 days of ordering even without paying for expedited shipping, so you really do not need to plan that far in advance. Want the specific details about each of the retailers, including print options and current pricing? 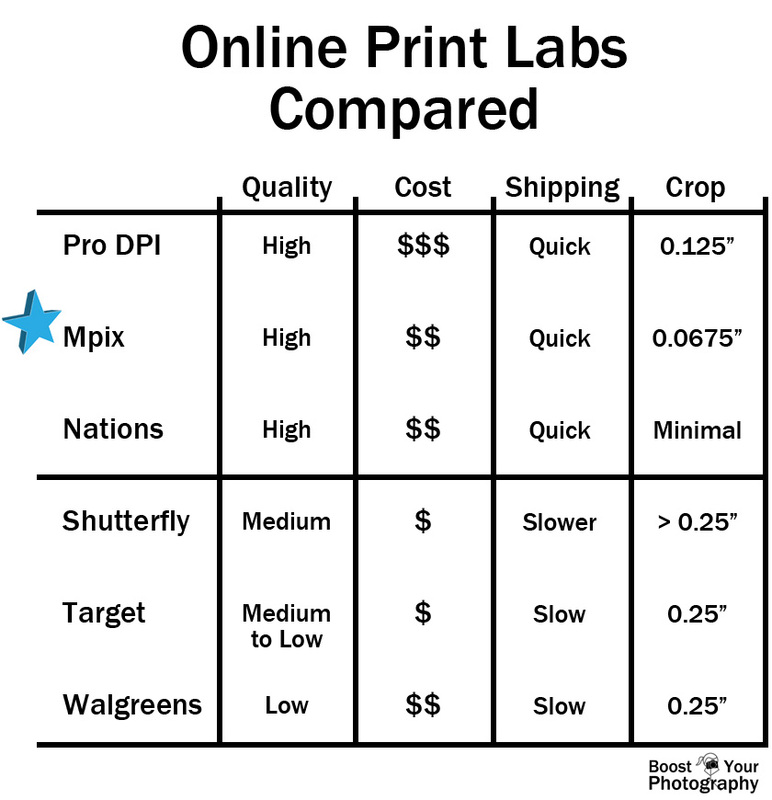 Check out the first post in this series, Comparing Online Photo-Printing Companies. 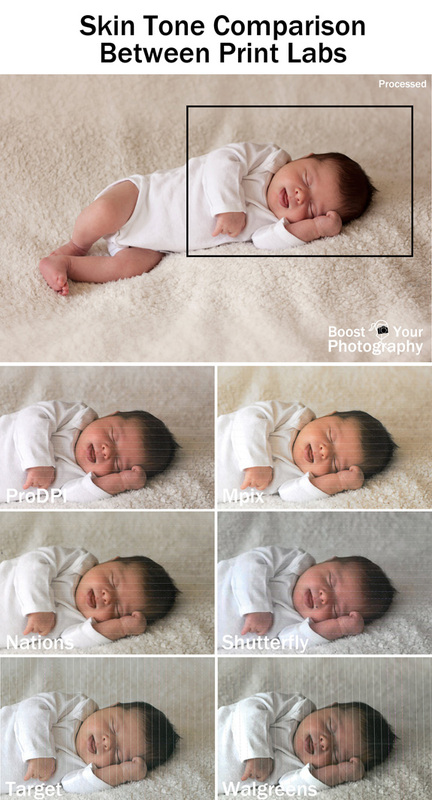 The next post in this series will discuss some of the different photo finishes available.